First page of Paul's epistle to Philemon in the Rochester Bible (12th century). Western calligraphy is the art of writing and penmanship as practiced in the Western world, especially using the Latin alphabet (but also including calligraphic use of the Cyrillic and Greek alphabets, as opposed to "Eastern" traditions such as Turko-Perso-Arabic, Chinese or Indian calligraphy). A contemporary definition of calligraphic practice is "the art of giving form to signs in an expressive, harmonious and skillful manner." The story of writing is one of aesthetic development framed within the technical skills, transmission speed(s) and material limitations of a person, time and place. A style of writing is described as a script, hand or alphabet. Calligraphy ranges from functional hand-lettered inscriptions and designs to fine art pieces where the abstract expression of the handwritten mark may or may not supersede the legibility of the letters. Classical calligraphy differs from typography and non-classical hand-lettering, though a calligrapher may create all of these; characters are historically disciplined yet fluid and spontaneous, improvised at the moment of writing. Calligraphic writing continued to play a role long after the introduction of the printing press in the West, official documents being drawn up in engrossed or handwritten form well into the 18th century. A revival of calligraphy in the later 19th century was associated with the Art Nouveau and Arts and Crafts movements, and it continues to be practiced, typically commissioned for private purposes such as wedding invitations, logo design, memorial documents, etc. Codex multorum librorum est; liber unius voluminis. Et dictus codex per translationem a codicibus arborum seu vitium, quasi caudex, quod ex se multitudinem librorum quasi ramorum contineat. "A codex is composed of many books; a book is of one scroll. It is called codex by way of metaphor from the trunks of trees or vines, as if it were a wooden stock (caudex), because it contains in itself a multitude of books, as it were of branches." A tradition of biblical manuscripts in codex form goes back to the 2nd century (Codex Vaticanus), and from about the 5th century, two distinct styles of writing known as uncial and half-uncial (from the Latin "uncia," or "inch") developed from various Roman bookhands. With the onset of the Middle Ages from about the 7th century, literacy in Latin Europe was increasingly limited to the monasteries. 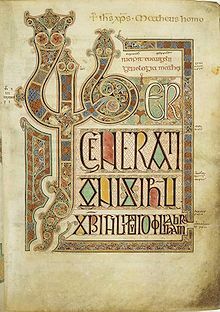 The tradition of illumination has its origins in Late Antiquity, and reaches early medieval Europe in about the 8th century, notable early examples including the Book of Durrow, Lindisfarne Gospels and the Book of Kells. Calligraphy in a Vulgate of AD 1407 on display in Malmesbury Abbey, Wiltshire, England. The Bible was hand written in Belgium, by Gerard Brils, for reading aloud in a monastery. Blackletter (also known as Gothic) and its variation Rotunda, gradually developed from the Carolingian hand during the 12th century. Over the next three centuries, the scribes in northern Europe used an ever more compressed and spiky form of Gothic. Those in Italy and Spain preferred the rounder but still heavy-looking Rotunda. During the 15th century, Italian scribes returned to the Roman and Carolingian models of writing and designed the Italic hand, also called Chancery cursive, and Roman bookhand. These three hands — Gothic, Italic, and Roman bookhand — became the models for printed letters. Johannes Gutenberg used Gothic to print his famous Bible, but the lighter-weight Italic and Roman bookhand have since become the standard. During the Middle Ages, hundreds of thousands of manuscripts were produced: some illuminated with gold and fine painting, some illustrated with line drawings, and some just textbooks. Towards the end of the Middle Ages, administration in the states of Western Europe became more centralised. Paper was again widely available in Europe, which allowed a bureaucracy with standardized bookkeeping. In late medieval England, this led to the development of the Chancery Standard of Late Middle English, along with new forms of standardised calligraphy used for the production of legal or official documents. By the mid-15th century, Chancery Standard was used for most official purposes except by the Church, which still used Latin, and for some legal purposes, for which Law French and some Latin were used. It was disseminated around England by bureaucrats on official business and slowly gained prestige. The production of finalized, calligraphic copies of documents in Chancery hand came to be known as "engrossing", from Anglo-French engrosser (Old French en gros "in large (letters)"). In the late 1490s and early 1500s, the early printer Richard Pynson favored Chancery Standard in his published works, and consequently pushed the English spelling further towards standardization. In the mid-1600s French officials, flooded with documents written in various hands and varied levels of skill, complained that many such documents were beyond their ability to decipher. The Office of the Financier thereupon restricted all legal documents to three hands, namely the coulée, the rhonde, (known as Round hand in English) and a Speed Hand sometimes simply called the bastarda. Edward Johnston, founder of modern calligraphy, at work in 1902. The modern revival of calligraphy began at the end of the 19th century, influenced by the aesthetics and philosophy of William Morris and the Arts and Crafts movement. Edward Johnston is regarded as being the father of modern calligraphy. After studying published copies of manuscripts by architect William Harrison Cowlishaw, he was introduced to William Lethaby in 1898, principal of the Central School of Arts and Crafts, who advised him to study manuscripts at the British Museum. Calligraphy today finds diverse applications. These include graphic design, logo design, type design, paintings, scholarship, maps, menus, greeting cards, invitations, legal documents, diplomas, cut stone inscriptions, memorial documents, props and moving images for film and television, business cards, and handmade presentations. Many calligraphers make their livelihood in the addressing of envelopes and invitations for public and private events including wedding stationery. Entry points exist for both children and adults via classes and instruction books. The multimillion-dollar Saint John's Bible project for the 21st century, completed in 2011, had engaged Donald Jackson with an international scriptorium. It is designed as a 21st-century illuminated Bible, executed with both ancient and modern tools and techniques. The earlier 20th-century "Bulley Bible" was executed by a student of Edward Johnston's, Edward Bulley. The digital era has facilitated the creation and dissemination of thousands of new and historically styled fonts. Calligraphy gives unique expression to every individual letterform within a design layout which is not the strength of typeface technologies no matter their sophistication. The usefulness of the digital medium to the calligrapher is not limited to the computer layout of the new Saint John's Bible prior to working by hand. Graphics tablets facilitate calligraphic design work more than large size art pieces. The internet supports a number of online communities of calligraphers and hand lettering artists. British Library (2007). Collect Britain. Retrieved 22 February 2007. Cardozo Kindersley, L.L. (2007) The Cardozo Kindersley Workshop. Retrieved 15 April 2007. Child, H. ed. (1986) The Calligrapher's Handbook. Taplinger Publishing Co.
Child, H. (1976) Calligraphy Today: A Survey of Tradition and Trends. Cassell & Collier Macmillan Publishers Ltd.
Cockerell, S. (1945) from "Tributes to Edward Johnston" in Child, H. & Howes, J. ed.s (1986) Lessons in Formal Writing, pp. 21–30. Gilderdale, P. (2006) "What's in a grip? A study of historical pen holds", Letter Arts Review 21(1): 10-27. Gilderdale, P. (1999) "The Great Copperplate Myth", Letter Arts Review 15(1): 38-47. Green, R. (2003). Bulley Bible (1969–83). Retrieved 28 October 2006. Harris, D. (1991) Calligraphy: Inspiration, Innovation, Communication. Anaya, London. Hewitt, W.G. (1944–1953). Letters of William Graily Hewitt to Sidney Feinberg. Retrieved 15 April 2007. Hewitt, G. (1930) Lettering: For Students & Craftsmen. Pentalic 1976 ed. Johnston, E. (1906) Writing, Illuminating & Lettering. Dover Publication 1995 ed. Knight, S. "The Roman Alphabet" in The World's Writing Systems (supra), pp. 312–332. Reaves, M., & Schulte, E. (2006) Brush Lettering: An Instructional Manual in Western Brush Calligraphy Revised Edition, Design Books New York. Trinity College Library Dublin (2006) The Book of Kells DVD-ROM.